Downsizing and ordering a trailer! I am in Prince Edward Island, where my not-so-big house is. I have spent the past week with the help of my mother and my best friends downsizing my belongings in the house, meeting with a real estate agent and doing some small chores to get the house ready to sell. It has been a big week. My mother and I arrived first and our first day here we were able to go through almost all of my belongings left in the house and decide what should stay and what should go. We did pretty well, moving quickly and getting rid of much of what I really didn’t need. I managed to avoid being overly sentimental and parted with a lot of things. I managed to get rid of that which I was parting with in 2 ways. By chance we met a couple who are moving to the Island for the next year or so. They have lived a nomadic lifestyle and have few belongings. I am happy to know that I can help them out. I spent almost a decade being fairly nomadic, it’s nice to get the chance to settle somewhere for a bit, but getting all of the housewares you need can be daunting. That which they did not need was donated to a couple of local organizations. I was able to donate to the local women’s shelter, the Habitat for Humanity Re-Store and to the Salvation Army. I work for a not-for-profit and it felt right to give some really useful and some beautiful things to the women’s shelter. It is difficult to restart your life when you left the old one with just the clothes on your back. 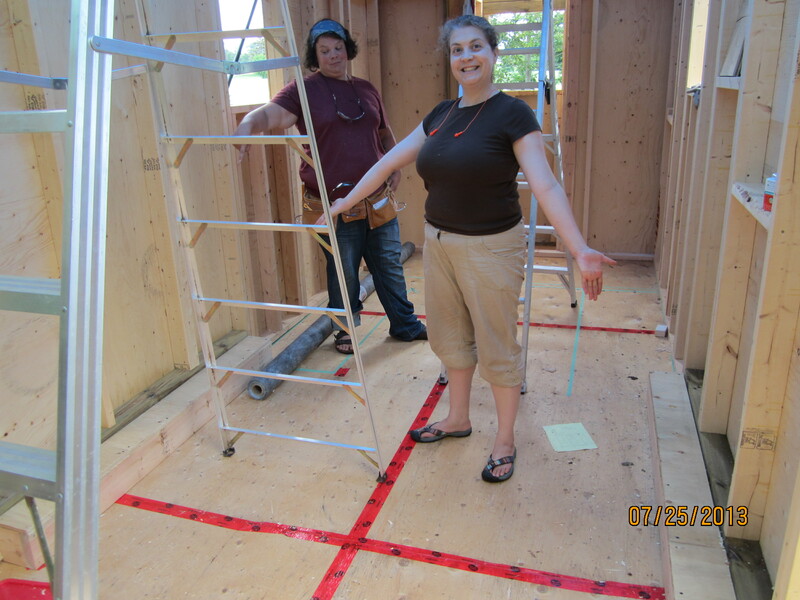 I was also able to help friends with their tiny house build, which was fantastic. My nomadic life was in theatre and I can handle a drill, but haven’t had the opportunity to use saws much. One of the couple who are building their tiny house in PEI is a cabinet maker and she set me to work using a skill saw and a mitre saw. I built 2 boxes to cover the wheel wells of the trailer. I also made a bunch of terrible box jokes. They ordered their trailer from a welder in New Brunswick, who has built trailers for several tiny homes now and I ordered my trailer this week! So excited. It will be ready a year almost to the day that I first learned about tiny houses. That makes me rather happy. So I will be back in this part of the world about a month from now to pick up my trailer. Not that I’m excited or anything… I ORDERED A TRAILER!!!! !